Meet the Imperial Guardsmen of Blazer Company, garrisoned in a tactical position known with typical soldier’s irony as Paradise City. As the Tau attack, the regiment’s famed Hellhound tanks fry Tau warriors and mortars drop explosive shells on their heads. In the midst of the battle, the fate of war could tip in the Imperial forces’ favor or tip towards betrayal and annihilation! I’d been keen to write more comic book work for a while, and when the opportunity came along to work with Boom Studios, I was hungry to get pen to paper. GW and Boom were looking for an archetypical Imperial Guard story, and I had one in mind, the story of Blazer Company, a Cadian regiment fighting a tau invasion force. 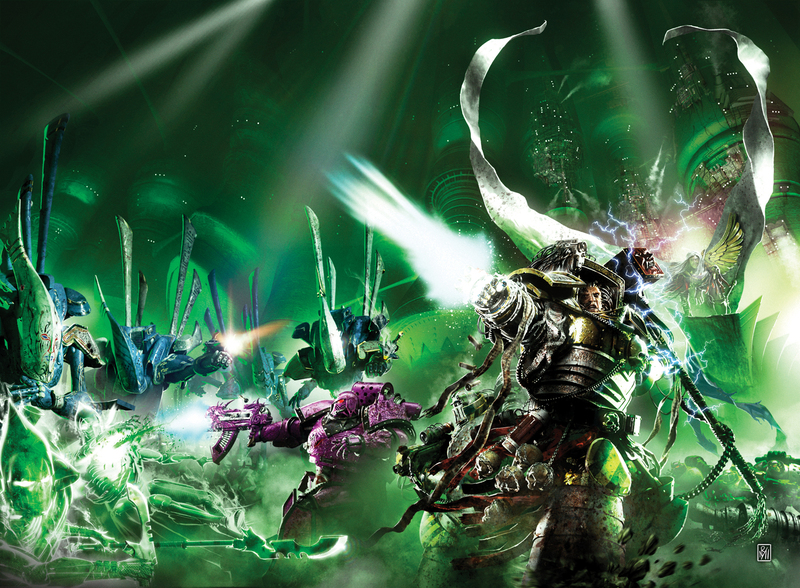 We kept the story pretty simple, as the comics were to be enjoyed by people who’d never heard of 40k as well as those who had. Once again, it was a nice challenge to tell a compact story in a confined space, as any one of my novel editors will tell you that keeping to an agreed word count isn’t something I do well. Comics don’t offer you that luxury, so you absolutely need to be on target. There’s no room for waffle, and everything you do needs to serve the story and artwork, so that splash art falls on the correct pages and images can be placed for maximum effect. The writing serves that purpose, as you’re writing in a different medium, where the visual impact is at least as important as the words. It also makes you consider the pace and beats of the story in much greater detail than I might do in a novel. A lot of comics nowadays seem to be written with the trade paperback in mind, rather than the reader who buys it every week and looks for that wonderful cliffhanger that gets them coming back for more the following week. With these stories I wanted to hark back to the days when my gran was buying me 2000AD every week. Each story ended on a massive, edge-of-the-seat peril for the heroes, and you best believe I was champing at the bit to get my next week’s fix. Whether Fire and Honour had the same effect on its readers, I can’t say, but that’s the effect I was aiming for with each episode’s ending. In telling a story with Blazer Company, I got to introduce Captain Hawkins and Sergeant Rae, characters I hoped to come back to at a later date. Sadly Boom no longer do Warhammer comics, but should any other studio run with it, then they’re characters I’d love to do more with. Though they work through only a four episode run, I got to know and like them enough to feel they had legs for more stories. And using the tau was just fun, as it’s been too long since we’ve seen them in action in fiction. Telling these stories gave me real confidence in my ability to write a decent comic book yarn. Grant Morrison and Alan Moore don’t have anything to worry about, but I was very proud of Fire and Honour.